I love a good shower gel, I always find shower gel to be the product I have most of out of body and hair care and I always love having a mix of scents and smells and think they are a lovely way to mix up your bath and I think this is such a nice way to theme the scents to the season or to use something that will help you sleep before bed, or something to energise you in a morning. I was happy to see this in a Birchbox I got a while back as my husband loves foam shower gels so I knew it would definitely get used in our household. 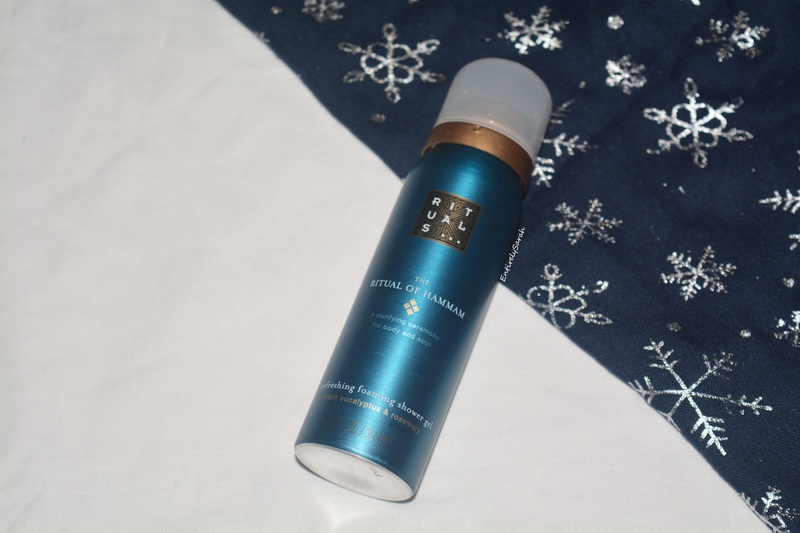 The Rituals foaming shower gel, comes in a nice aerosol can which is quite typical of these types of foam shower gels which is really nice as it feels sturdy and secure. I think this helps to package the product well as the aerosol appears to help the foam production, such as a hair mouse which also comes in this style can. The product has a secure lid, and the spray nozzle is really easy to use providing a good amount of product when pressed. I love the way the can has a bright, vivid blue logo and signifies it is part of the Ritual of Hammam range with others being colour coded too. Scented with eucalyptus and rosemary, this isn't my typical scent of choice, and while I wouldn't say I was massively keen on it, it did smell nice for the scent combination. I find I go more for the sweeter scents, so if I hadn't got this in a Birchbox and I had gone into store for one I perhaps would have left with a different scent, but I don't hate this one. Rituals have around 8 different ranges to choose from and I have seen this in ten different scents on the website, so you wont be stuck for a scent choice if you do want to try this. I took this into the shower with me, excited to give it a go, and was met with confusion. Normally with other shower foams I have tried it sprays out in a big foam, just like a hair mouse for example. This, however, did not. It sprays onto the hand and makes almost a gel like consistency to work with that only foams when worked into the hands and prompted to foam. In my confusion I tried to look for instructions, I tried shaking the can, and retrying it, but as far as I can tell it does come out in a gel, liquid form and then transforms into the foam as you work it into the skin to wash with. Personally, I found this a bit weird and would have really preferred the product to come out of the can in a huge foam ball and really make it seem like a foam from the start, but I think this is all personal preference. I found this to work really nicely and the product really did leave my skin feeling soft, smooth and very clean. A little bit went a long way and was easy to lather up when rubbed into the skin to clean it and leave it feeling soft and clean. Overall, I don't think this is a bad product, it just didn't perform in the way I expected it to, and so I feel like it isn't something I would reach for or gravitate towards if I wanted a foam shower gel as I prefer other brand products to this one. I think the scent is nice for the product description, but again isn't to my taste. I will however say I have passed this onto my husband, the usual household user of all things foam shower gel, and he really enjoyed it. Contrary to my thoughts he loved the way it foamed up, and said it worked really well, even suggesting it may be replacing his love for the staple Imperial leather ones we often get that he typically loves. So while this is a no from me, my husband has really gripped onto this and I can see this being a nice treat I can add to his stocking as a little bit of a more expensive treat for him to stock up on through Christmas. A 50ml version of this, like the one above, is £4.50 here, while the 200ml size is £8.50 here. I definitely think these are better value in the larger size, and I will be shopping for some of these as stocking fillers for my husband as he enjoys it, I think I will get him a different scent to mix it up a bit, but I will shop around and see what I think he will like. I feel like this is a mixed review, but I hope you liked hearing both points of view, I would love to know if you have tried any foam shower gels as I would like to test out more and always love your recommendations!